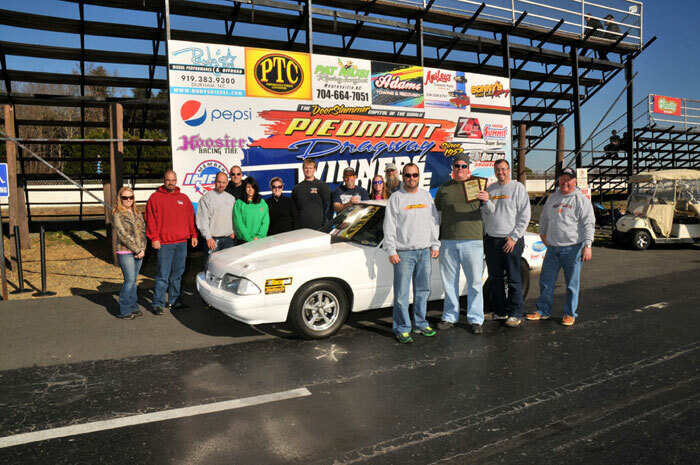 Racers had campaigned to return the Thanksgiving Tradition $20,000 Footbrake race to Piedmont Dragway, where it was originated by Bob Harris. Loose Rocker Promotions listened, and brought the Fall Footbrake Frenzy V “home” to the dedicated 1/8th mile facility in Julian, NC. Despite the second coldest Thanksgiving weekend in the event’s history, racers responded enthusiastically, turning out in great numbers. In the week leading up to the race, the area received some rain, followed by freezing temperatures, generating a natural cooling system under the track. 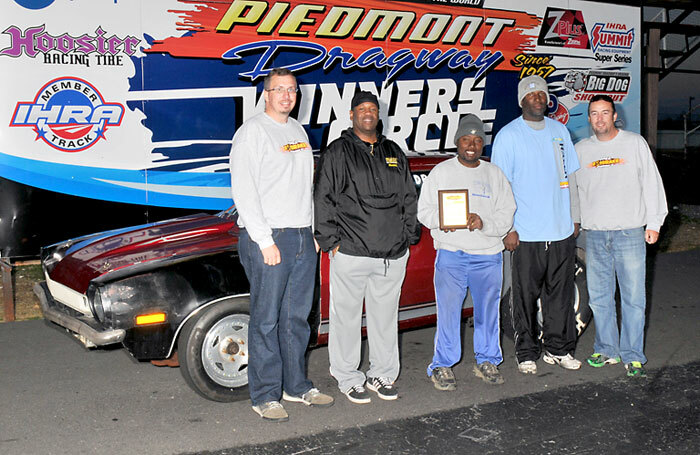 With an overnight low of 21 before raceday and a high struggling to reach 50, the Piedmont Dragway staff had their work cut out for them, but they prepared for it. The crew worked the track surface for three hours Thanksgiving morning with a full prep including a complete 1/8th mile of rosin! With unseasonably cold temperatures, an overabundance of end-of-season breakage and an impressive car count of 216 on Friday, promoters were forced to combine the Saturday $20K and Sunday $5K in order to keep the racing in the warmer daylight hours. Sunday’s complete $5K payout structure and prizes were added to Saturday’s $20K Main Event from top to bottom, creating the first $25,000-to-win race, with a staggering $280 paid to 3rd round winners! Single-day entries were discounted similar to the Weekend Entry deal, and the buyback cost was untouched at a $100. Another big field of 208 cars vied for the $25,000. Before sundown on Sunday, Loose Rocker awarded a total of over $65,000 in cash and prizes! 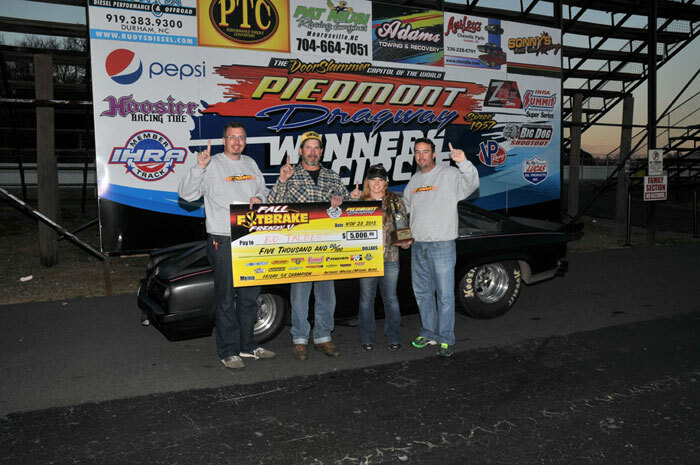 Loose Rocker returns to Piedmont Dragway for the $20,000 Thanksgiving Tradition Fall Footbrake Frenzy VI, November 28-30, 2014. Davis turned his season around at the very end. He borrowed Tony Thrasher’s clean Chevy II, and headed for Piedmont. He had only minimal seat time in the car prior to the event, but it quickly became apparent that they were a good match. The very next round, he received confirmation of his reversal of fortune. Former Bracket Finals Champion Ernie Humes laid out a stout .014-backed dead-on 6.695, but Davis got inside of it with an even better .014 and a dead-on 6.501. It wasn’t going to get any easier. From fifth round on, 24 of the 40 reaction times hit by all racers were double-oh or teen. As good as the field was as a whole, Davis was better. He finished off the final four rounds of the race with a staggering performance, trimming the tree with four consecutive lights no worse than .006. He backed up a .006 dead-on 7 in round six with an even better .008 package in the quarterfinals to oust Randy Biddle, Jr.’s (Burbank, Ohio) .015-backed 6.589 (6.59 dial-in) effort. Jake Milstead (Lexington Park, Md.) used an .017 light and a dead-on 6.556 to trailer Brian Cireddu (Brunswick, Ohio), and Nicole Talbert (Woodbine, Md. ), who was hot off a .005 package put down an .021, 6.939 (6.94) on her bye run. In the semifinals, Milstead repeated his performance, using an .018 bulb and a 6.545 (6.55) to win a double-breakout over Talbert’s .041, 6.914 (6.94). Davis relaxed for his semifinal bye run, and tagged a .001 light, although he missed his entertaining 330′ drop attempt (a stunt made famous by Jim Young), carding a 6.975 on a 6.85 dial. Davis faced Milstead in the finals for two Big Checks totaling $25,000. Milstead’s Mustang took a .02 handicap, 6.55 to 6.53, but Davis started chiseling away at it immediately with a .004 to .016 advantage off the starting line. Milstead couldn’t tighten it up enough, and broke out with a 6.524 (6.55), handing the win to Davis’s 6.547 (6.53). One thing hasn’t changed: Adam Davis has never won a $20,000 race. It was a $25,000 race. Ed Talbert, of Woodbine, Md., got to watch his daughter drive her S-10 into the semifinals of the $25,000 Main Event, but gave up a time run to do so. With two entries going into the third round of Friday’s postponed completion, Talbert shrugged it off. Experience is Talbert’s keystone, something he’s got plenty of. While always a player, Talbert first gained the spotlight with a runner-up in IHRA’s Summit World Championship program. Since then, he’s had a win and a runner-up at the World Footbrake Challenge, and won an NHRA Bracket Finals title. Talbert’s ride for the weekend was actually his daughter’s Vega, a twin to his own Vega resting at home. His unconventional shallow-staging of a high-gear only car blows both minds and doors off the competition. With a fresh 540 c.i. engine combination, Talbert used low gear to blast out a 5.87 before going back to his high gear setup. “I’ve counted the tree all my life. When I built the faster car, I fought going red. Leaving in high gear put me back on my spot… and I like the MPH. It’s so fun to drive! I literally had a lot of fun,” he grinned. Talbert’s .007 reaction time in the 6th round earned him a bye in the quarterfinals. 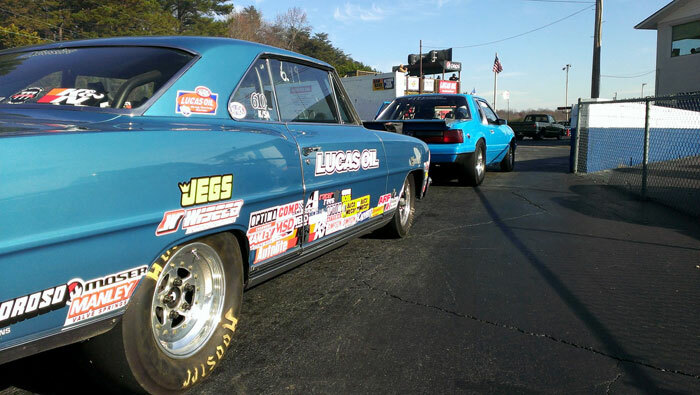 He took a stab at the tree with an -.011 early leave and posted a 6.470 (6.44). 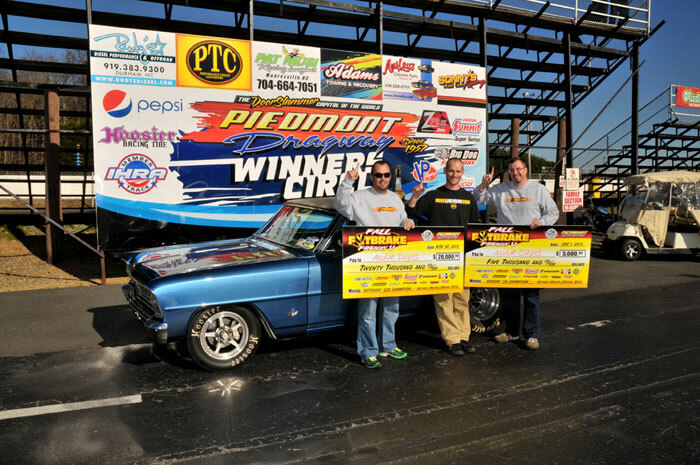 Steve Alford (Angier, NC) advanced on a -.001 red by Matt Obertanec (Brackenridge, Pa.) in the battle of the short cars, and former $20K Champ Bob Mullaney (Rockaway, NJ) tree’d Jake Prewitt (Cincinnati, Ohio) to move on. In the semifinals, after side-by-side .008 bulbs, Talbert edged Mullaney at the stripe by .004, 6.478 (6.46) to a 6.382 (6.36). 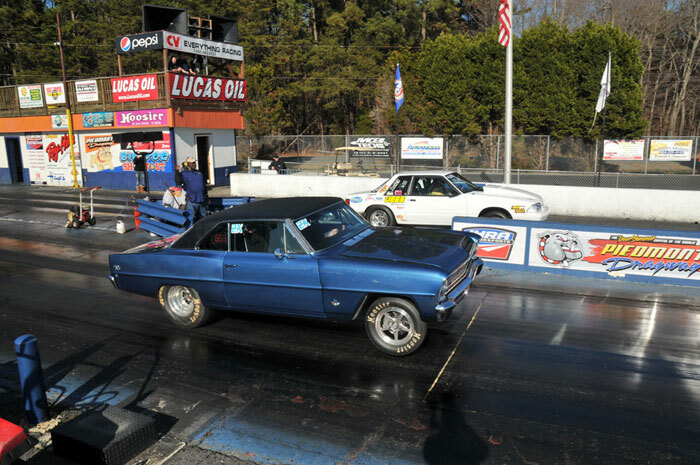 Alford, a two-time World Footbrake Challenge winner, put his Pinto into the finals via the bye run, where he showed a -.002 light and a 6.653 (6.68). Both drivers showed more caution in the finals. Alford carried a slight advantage off the line, .034 to .044, but carried it too far and broke out with a 6.646 (6.65). 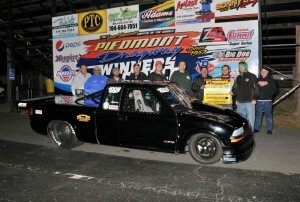 Talbert traded the stripe for the win light with a 6.486 (6.47). “All in all, it was a real good weekend,” said Talbert. “I told Nicole, ‘Do you know how many people we know here? A few years ago, we didn’t know anybody. Now we know probably 75%. They’re family. 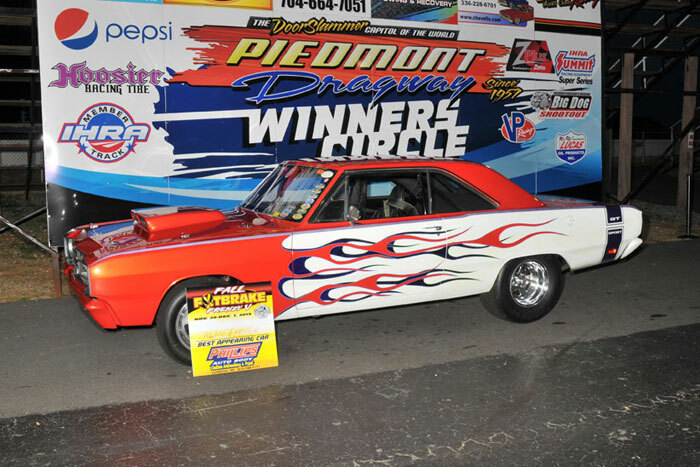 Loose Rocker returns to Piedmont Dragway for the $20,000 Thanksgiving Tradition Fall Footbrake Frenzy VI, November 28-30, 2014. 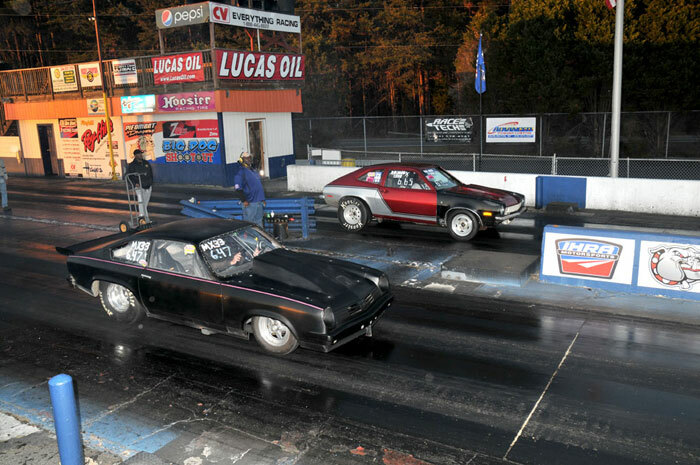 The next Loose Rocker event will take place March 14-16, 2014 at Virginia Motorsports Park, featuring two huge payout FAT $5K’s and a $10K Main Event, for both Top ET and Footbrake. For more information, visit www.looserocker.com or “Like” Loose Rocker on Facebook at www.facebook.com/LooseRocker. 1st – William Roberts .011 pkg – $200 + $200 Summit Gift Card! 2nd – Tim Davis .023 pkg – $150! 3rd – Chuck Grover .024 pkg – $100! .001 – Ron Phipps – $200 Summit Gift Card! BEST LOSING PACKAGE ROUND PRIZES! WIN – $150 GIFT CERTIFICATE! R/U – $50 GIFT CERTIFICATE! LIKE Loose Rocker on Facebook!